When Calvin Griffith sold the Minnesota Twins in 1984, he was the one of the last of the family owners whose franchise represented their principal business and source of wealth. Griffith spent nearly his entire life in baseball, spending his young adulthood working in one capacity or another for the Washington Senators organization that his uncle Clark owned. Upon the death of his uncle, Griffith took over the franchise and ran it from 1955 to 1984. He ran the operation as a family company, with relatives holding nearly all of the key positions. 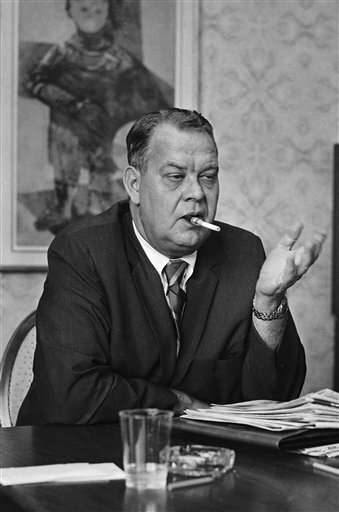 In 1961 he moved the Senators from Washington to Minnesota, and for the next ten years he oversaw one of baseball’s most profitable and successful franchises. Griffith struggled during his last decade in Minnesota, however, after a couple of key family members died and baseball’s changing economics undercut his operational philosophies. In the summer of 1922 the family was visited by James’ sister Addie Robertson Griffith, wife of Clark Griffith, the owner of the Washington Senators. It was soon decided that Calvin (age 11) and his younger sister Thelma (age 9) would return to Washington, and move in with the Griffiths, who had no children of their own. From this point on Calvin and his sister were raised as members of the Griffith family. Upon the death of Calvin’s father a year later, the rest of the Robertson family moved to Washington. Although Calvin and Thelma were never formally adopted, they did have their names legally changed – in Calvin’s case from Calvin Griffith Robertson to Calvin Robertson Griffith. Clark Griffith died on October 27, 1955, and on November 1, at age 43, Calvin was elected president of the Washington Nationals. In the reorganization, brother-in-law Joe Haynes was named roving minor league pitching instructor; brother Sherry Robertson became assistant farm director; brother Billy Robertson assumed the position of supervisor of Griffith Stadium personnel and maintenance; and brother Jimmy Robertson remained as director of concessions. Calvin and his sister Thelma had inherited 52 perecent of the Nationals’ essentially debt-free franchise. The ballclub and the stadium were valued at approximately $4 million. The Senators became the Minnesota Twins, moved into Met Stadium, took over the concessions business, and there were relatives all over the place: Joe Haynes, Thelma Haynes, Sherry Robertson, Billy Robertson, Jimmy Robertson. You didn’t know who was in charge of what. Your reaction was, “What is this? We didn’t get a ballclub. We got a family.” It was like being around the Beverly Hillbillies. Much of the improvement was due to quality players that were signed and developed in the Senators/Twins farm system, most notably Hall of Famer Harmon Killebrew, outfielders Bob Allison, Jimmie Hall, and three-time batting champion Tony Oliva, shortstop and 1965 MVP Zoilo Versalles, and pitchers Camilo Pascual and Jim Kaat – all important members of the 1965 pennant-winning ballclub. By the end of the decade the system had also produced future Hall of Famers Rod Carew and Bert Blyleven. As Griffith searched for a replacement for Martin, he uttered one of his more memorable quotes: “I can’t tell you what I intend to do, but I can tell you one thing; it won’t be anything rational.”8 Griffith eventually hired Bill Rigney, and in 1970 the Twins again won AL West. Once again they lost the American League Championship Series in three straight games to the Orioles. This was to be the Twins’ last championship under Griffith’s ownership. Rigney survived as manager until 1972, when he was replaced in mid-season by Frank Quilici. After 1970 the team drew over a million fans only twice (1977 and 1979) at Metropolitan Stadium. These lower attendance figures meant less revenue for salaries, which Griffith already considered too high for mere ballplayers. Griffith reacted to the new baseball economics by futilely resisting changes brought on by salary arbitration, player agents, free agency, and the increasing importance of television revenue, which gave an advantage to teams in larger markets. As time moved on, Griffith was considered a “dinosaur” or a “vestige of yesterday” relative to the new baseball owners of the late 1970s. Griffith’s remarks turned into a question and answer format. Griffith began to make comments about specific players and about race in general. Coleman later said, “I was wincing the whole time thinking, ‘you don’t want to say that.’ ” 9 Coleman was not there with a tape recorder or anything with which to write, so when he returned from the meeting he wrote everything down from memory. The next day he called his editors to ask if they wanted him to write a story based on what he had heard. They called back and said yes, and that it would run in the Sunday paper. How does he expect these players to respect the thing that’s across their chest – Twins – when it’s coming right from the top that he doesn’t care about the players? From Griffith’s perspective the comments from the meeting were blown out of proportion and misunderstood. Also from his perspective, comments made in a Lions Club meeting were meant to stay within the walls of the Lions Club meeting. It also had been reported that Griffith had had “a few” drinks over the course of the afternoon and evening. In the latter years of the Griffith-owned franchise much was made of the rift that existed between Calvin and his son, Clark II. Disagreements that may have germinated when Clark did not consent to an apprenticeship in the minor leagues, as his father had done, led to the elder Griffith gradually losing trust in his son’s judgment. These disagreements manifested themselves in the organization's response to the changing nature of the business: free agency, advertising, and negotiations between the players’ union and the representatives of management, in which Clark II played a significant role. Calvin described his relationship with Clark in a curious comment: “This is a very close-knit family. I imagine you talked to Clark yesterday, and I imagine he may have told you that we don’t talk.”14 The addition of Thelma’s son Bruce Haynes to the executive mix further complicated the question of who would eventually inherit ultimate decision-making power after Calvin finally stepped down as president. Baseball Guide and Record Book. St. Louis, Missouri: Charles Spink & Son, 1960. Brackin, Dennis and Patrick Reusse. Minnesota Twins: The Complete Illustrated History. Minneapolis, Minnesota: MVP Books, 2010. Minnesota Twins Media Guides, 1961 – 1988. Coleman, Nick. “Griffith Spares Few Targets in Waseca Remarks.” Minneapolis Tribune, October 1, 1978. Goethel, Arno. “Martin Showed Foresight When Named Twins’ Pilot.” St. Paul Pioneer Press, October 14, 1969. Goethel, Arno. “Why Did Cal Bounce Billy?” St. Paul Pioneer Press, October 15, 1969. Griffith, Calvin R. “Griffith Not Happy with Armory Stadium Site.” Washington Post, January 17, 1958. “Griffith Nixes Report He’ll Sell Twins to Tampa Bay Group.” Sarasota Herald-Tribune. July 2, 1983. Kahan, Oscar. “Boss of Twins Bombarded by Advance Ticket Orders.” The Sporting News, January 11, 1961, 9. Lenehan, Michael. “The Last Pure Men of Baseball.” Atlantic Monthly, August, 1981. Libman, Gary. “Angry Twins beat K.C. in 11.” Minneapolis Tribune, October 2, 1978. Libman, Gary. “Angry Carew vows he will not play for Griffith’s Twins again.” Minneapolis Tribune, October 2, 1978. “Minneapolis: Big-League Town in Waiting.” Sport. December, 1959. Osterman, Jordan. “Griffith’s Gaffe.” Waseca County News, July 5, 2011. Povich, Shirley. “Cal Griffith Tries to Explain.” Baseball Digest, September, 1958, 51-52. Riley, Don. “Sports Eye Opener.” St. Paul Pioneer Press, October 13, 1969. Riley, Don. “Sports Eye Opener.” St. Paul Pioneer Press, October 14, 1969. Ringolsby, Tracy. “Sport Interview: Calvin Griffith.” Sport. April, 1984. Sinker, Howard. “Griffith: Talk Misunderstood.” Minneapolis Tribune, October 2, 1978. Smith, Gary. “A Lingering Vestige of Yesterday.” Sports Illustrated, April 4, 1983. Washington Post. “Clark Griffith Brings Home 5 More Children to Adopt.” November 24, 1925. 1 Calvin Griffith, “Griffith Not Happy with Armory Stadium Site,” Washington Post, January 17, 1958. 2 Shirley Povich, “Cal Griffith Tries to Explain,” Baseball Digest, September, 1958, 51-52. 3 Sid Hartman with Patrick Reusse, “Sid!” (Stillwater, Minnesota: Voyager Press, Inc, 1997), 95-96. 5 Don Riley, “Sports Eye Opener.” St. Paul Pioneer Press, October 13, 1969. 6 Don Riley, “Sports Eye Opener.” St. Paul Pioneer Press, October 14, 1969. 9 Jordan Osterman, “Griffith’s Gaffe.” Waseca County News, July 5, 2011..
10 Nick Coleman, “Griffith Spares Few Targets in Waseca Remarks.” Minneapolis Tribune, October 1, 1978. 12 Gary Libman, “Angry Carew vows he will not play for Griffith’s Twins again.” Minneapolis Tribune, October 2, 1978. 14 Michael Lenehan, “The Last Pure Men of Baseball.” Atlantic Monthly, August, 1981.